Today I decided to take my computer onto the balcony and work outside. I’ve often tried working outside in the past, but it’s a task that’s often easier said than done. The main problem is, bright sunlight normally makes it too hard to see the screen and finding the cursor can be particularly bothersome. It makes it difficult to work on documents and reduces productivity. The other problem is, too much sunlight can make a laptop computer become incredibly hot. That’s not good for electronics. However, the balcony here has a shade I can wind down. After I lowered it, my laptop was no longer bathed in sunlight and the screen was much easier to see. It’s the first time I have every successfully managed to work outside for any length of time. People often get the idea that digital nomads can work from anywhere—even the beach. In reality, there are all sorts of limiting factors that people don’t consider. For instance, I would not want to work from the beach. I’d be worried about getting sand in my computer. Especially on a windy day. Depending on the beach, there may also be too many distractions. A nice, quiet balcony though, with the shade pulled down, that’s a different matter and, as I was working today, I could even hear the sea. 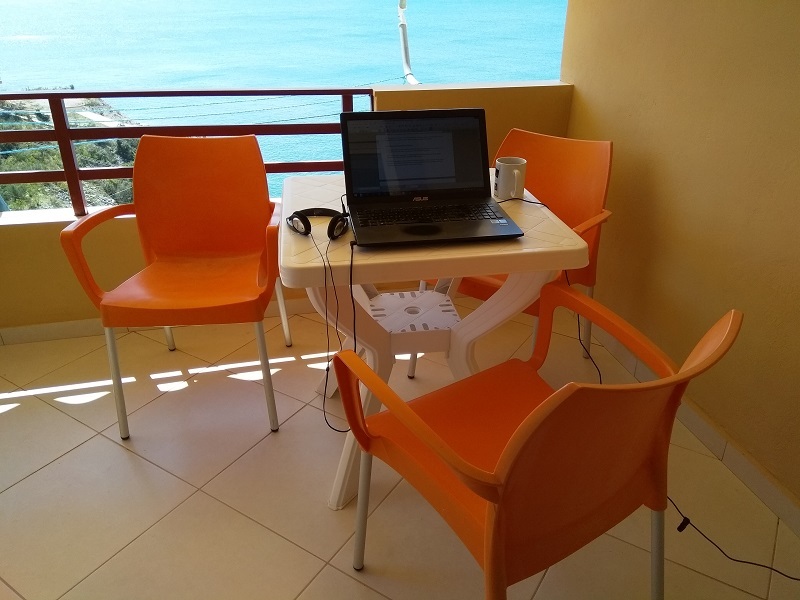 My life as a digital nomad and freelance writer is very different from the one I used to have. I can remember all those hot summer days I used to spend shut away in warehouses, factories, or cold stores. Now, even if I’m working inside, I can have the windows open and feel the breeze on my face. I can also stop any time I want to and make a coffee or take a stroll in the sun. Earlier this year, someone said to me I won’t be able to go on living like this and travelling forever. I disagree. “Forever” is probably out of the question unless I discover the secret to immortality, but there is no reason why I should not be able to go on living as I do for a very long time. Should I wish to continue doing so, that is. At the moment, I do wish to do so. This is the life I always wanted. Now I have it, I don’t see any reason why anything needs to change.